I’m down in Dorset this weekend so decided to take advantage of the fact and have a run in Weymouth. Nice flat promenade … and not so nice gusty winds trying to blow me into the sea. However, it was nice to run there even though it wasn’t the ice cream eating weather I normally associate with Weymouth. Also I was running around in light running gear (plus bright pink socks of course!) and everyone else was bundled up in thick winter coats, scarves and hats. Felt a bit of a twerp. However the wind was pushing me along from behind so it wasn’t all bad. Could see Little Sis clearly in her new neon pink top in the distance. She was slightly slower than me so every step brought me a tiny bit closer. Problem one. I had to stick to around an 8:25 – 8:30 minute / miles pace to bring me home at the 85 minute goal, but my brain was going into ‘Parkrun Mode’ and shouting “She’s only 250 metres away!” and “Just a BIT quicker – you can catch her!” and “NEXT TARGET!! Overtake her quick! !” Tried to ignore brain and keep legs going at right speed. Boyfriend had already disappeared. Presumably into a nice warm pub as soon as the wind rose and he got out of sight of me and Little Sis. Sensible chap. There wasn’t any rain but there was a lot of wind. The weather kind, not the sprouty kind. I’d ended up tying my jacket around my waist as I’d got warm but it was blowing out like a parachute and slowing me down so put it back on again. I’d started at the Theatre by the new tower and had ran along the promenade past Rossi’s towards the White Horse. It was nice and flat until the hill up to the Outlook Café and I’d turned around and retraced my steps back down the hill and along the promenade again. I’d gone back to my starting point and caught up with Little Sis and boyfriend at the end of their runs. They warmed down and went off to find a hot cup of coffee and I carried on to the end of the harbour wall and past the new tower and past the lunatics fishing in the dark. Who no doubt were surprised by the lunatic running in the dark. I doubled back and ran down the side of the harbour avoiding the old tram tracks still criss-crossing the road. Up the steep stone stairs up to the bridge that lifts up (and which had lifted up and interrupted my first 12 miler earlier in the year giving me a much appreciated breather!) and down the other side of the harbour past the pubs and fishing boats to the beacon light at the end with the fort rising up in the dark on my right. Back along the cobbled streets to Brewers Fayre and up to the Nothe Fort which was quite spooky in the dark. I nearly tripped over a dog running in the gloom while circling the fort and then it was back down the hill and back along the harbour side and to the Promenade and finished the run along the front of Weymouth not far from where I started. Finished up and no-one was around! No toddler to hang a medal around my neck or family with cups of steaming coffee! Checked my phone to find the following message. “We’re in a pub called The Ship”. Charming. Instead of welcoming me with an ice cream or cup of coffee (either warmly appreciated) they’d gone to the pub. Went off to find a coke and a packet of peanuts. And found a fiver. 50p a mile … Wonder if I’ll find £13.10 at the end of the Marathon … or whatever that translates to in Euros. I wasn’t sure what to do on a Fartlek session so did a bit of sneaky research. Apparently the term Fartlek is Swedish for ‘speed play’ and simply means changing the speeds up and down and having a bit of fun. According to Wikipedia it’s unstructured training with changing intensities and speeds. I already knew someone else who ran this way … Oscar! So I decided to approach this run the same way that my sister’s Labrador approaches a run. He sprints for a bit when he sees a rabbit, runs around in circles, stops for a breather, has a bit of a jog and then does it all over again. Basically he has a fantastic time and gets some running done at the same time. The first obstacle was the upper lane was completely flooded for about 25 feet. I couldn’t persuade little Sis to run through it so we hopped up onto the bank and navigated the mud … thank goodness it was a Fartlek run not a speed session! I tried but couldn't persuade little Sis to run through it. I've taken the pic having run through it confident of being within 5 minutes of home and a hot shower! It was raining pretty steadily but it eased off after a mile or so. My sister was running at 10 - 11 min/mile so I ran on ahead for some of the speedier sections and doubled back in circles so we could run together. Me enjoying the fact I was on a solid surface again! The sheer amounts of mud and water coming down off of some of the hills meant that we were running slower than I wanted to on some of the tracks, but it was nice knowing that I could work the intervals around the terrain rather than having to increase or decrease speed at a time or distance marker. Navigating the muddier sections ... definitiely one of the slower intervals! I love running. I absolutely and genuinely love the way it makes me feel. However tonight was a struggle to get out of the door. I don’t know whether it was the chocolate orange I’d finished off earlier or the nap in the chair but I wanted to stay in the warm. Tonight’s session was a build up run where I’d start at a reasonably slow pace and build it up to a quicker speed. It was the first time I’d tried one of these so I had no idea what to expect. I tend to start at one pace and stick to that. Apart from the sprint finish at races of course. But a sprint finish is practically law. I started at a 9 minute mile. I was concentrating so hard on sticking to the pace I forgot to start the garmin. Bother. After a mile I increased the pace to an 8:40 min/mile, then after another mile, 8:20, then 7:40 and finally 7:20. I had added an extra bit onto the run to see whether I could make 5 miles out of my usual 4 mile route and overestimated so came in at about 5.5 miles. I aimed to maintain the 7:20 pace until the end of the run. As usual once I started running, I enjoyed it and was glad to be out there. The session was a good one too and I liked changing the speed and trying something new. All of my Week 2 sessions have so far been done in the dark with a headtorch. I’ve had family staying with me over Christmas and I haven’t been at work to get lunchtime runs in so I’ve struggled to fit in any daytime runs. Looking at the Garmin data when I got home shows a steady progression of speed which is good. Although I managed to press the lap button by mistake when I stopped to cross a road which confused the laps a bit, but the run was a success and I’ve found a new session I’ve enjoyed! Actual: 6.93 miles in 9 minute miles … if you include the pub stop. I have a confession. My pace looks pretty much bang on. However, this is because I ran a little bit too fast. Yes you read that right. I stopped at the pub for a call of nature. Unfortunately, not one of the mulled wine variety. And I left the Garmin running by mistake. I came out of the pub and my Garmin informed me I was currently moving at 59.59 minutes a mile. Bother. I carried on running. My pace wouldn’t be correct and I had made an unscheduled stop but I could carry on running at the correct pace and for the correct distance. However, distracted by heavy sleet and the thought of a turkey sandwich at home I sped up a bit too much and came in at a 9.15 minute/mile including the pub stop. Average moving pace of 8.51 minute/mile so all in all not too far off. Actual: 5 miles in 35:58 ... In Santa Outfit ... with a headtorch ... 3 hours after Christmas Dinner. I'd like to point out that Asics didn't give me this Santa outfit although I got a tweet yesterday to say they approved which was great! I seem to have found a company who do great running gear AND have a sense of humour! The Santa outfit was funny to wear although I seemed to be breathign fluff in for most fo the run due to the beard and it was made for someone about 6 inches taller than me. Note the extremely stylish turnups on the trousers! I thought I'd prepare for every eventuality and even had an excuse ready in case I passed a small child (Rudolph had escaped and I had to catch him) but luckily there weren't any witnesses to my outfit! I didn’t know what to expect from this run although I’d been told it might be a little bit hilly. However, I’d been promised a bacon sandwich at the end so naturally this being the important part of that conversation I’d forgotten about the hills. My new trail shoes are currently being withheld until Christmas (despite my pleas, sulking and toddler tantrums) so I was in road shoes with YakTrax on them which are like rubber bands you slip over the shoes with metal springs on them and a strap across the mid-foot. They worked really, really well – I definitely wouldn’t have been able to run this course on standard road shoes without some serious falls! We met at the café and started on an undulating trail with soft ground covered with leaves and a sharp downhill with muddy parts. We stopped at the bottom of the hill to allow everyone to start again as a group and the quicker runners doubled back. We started up a steep, dragging uphill on a trail with soft crumbling ground – I was very glad I’d worn the additional grips on my shoes. By the time we reached the top of the hill, my quads were grumbling at me but the view was amazing! However, after the drag up the hill it was time for payback – a fantastic downhill and a chance to stretch my legs out. These paths were more grassy and sandy and not so boggy so it was lovely to fly down them. The only trouble was that the speed increased and by the time I spotted the main road at the bottom I wasn’t sure I’d be able to put the brakes on in time. I had visions of flying through the pub window taking the Christmas tree with me and landing on the bar. Hopefully with a pint in one hand and a festive pork pie in the other. But it wasn’t to be. I managed to stop in time and we all headed back up the hill via a sharply angled lane. A small downhill and we moved towards another hill via a small muddy track so we all moved into single file and ran up it. It was muddy and everyone had wet feet but we all chatted the whole way – even if it was only to shout “Wheeeeee! !”” on the downhills – and it made a tough hill run a LOT of fun. We went through a couple of kissing gates and into a muddy field marked with the cloven prints of sheep. The trainers had definitely changed colour by now and were a fetching shade of poo brown. As we ran through more and more mud they were definitely getting heavier too. We moved onto short springy grass and the area felt moor-like and as though we had moved areas and were running through the North of England rather than somewhere outside Birmingham. It was nice to run on and the downhill was long and fast. The ground became boggier underfoot and we were all liberally splattered with mud but it was a lot of fun running a course like this in a group. We stopped regularly to allow everyone to regroup and so people could run at their own speeds. We were still moving downhill and all of a sudden we turned to the right and were running down what appeared to be a streambed. There were a couple of inches of running water but no space on the narrow trail to move out of the water. At least the trainers were getting a wash. We got to the bottom of the path and onto a muddy and potholed lane. We were passed by 3 horses and riders who laughed as they saw us and said “You’re going to need wellies …” We smiled and waved back, but Dave said “Hang on. Why did those horses have wet stomachs?” We ran down the steep lane and around the corner and the road was completely flooded. Well … we were already wet. Seemed a shame not to take advantage of the chance to run through a great big puddle. We got to the bottom and a sharp right took us up the final uphill past some pretty cottages and onto a mushy trail … which was blocked by a fallen tree. A couple of options … being vertically challenged I took the ‘under’ option and back onto the muddy trail. My shoes were getting heavier and browner with every step. Finally made it to the top of the hill and the soft grass and from there a short downhill on lanes and back to the car park. And quite possibly the largest and most delicious bacon sandwich EVER. Trust me, this picture doesn’t do it justice. This session was supposed 7 miles in 9 minute miles, but Steve Smythe agreed that I could join a hill run with the Warwick Wasps over the Clent Hills. It was definitely a good hill run but due to the terrain and steep uphills I didn’t complete this at the correct speed. I did my 5 miles around Draycote Water which is a råeservoir not far outside Rugby and half of it is very flat and the other half is ‘undulating’. However, today it was a good choice as seemed to be pretty much the only place in the county that wasn’t flooded. Was soaking wet when I’d finished the run as the rain was pretty constant, but I wasn’t covered in mud so I counted that as win. My goal was 7:30 minute / mile and I came in at 7:23 minute / mile so reasonably close. Session: 6 miles at 9:30 minute/mile. I decided to use this opportunity for a longer slow run to get a bit of cross-country in. Well, it seemed like a good idea at the time. I’d also managed to persuade a work friend to come along for a run. I’d mentioned it might be a bit muddy in one place but we should be ok with road shoes … I suspect I may not be allowed to forget this rather inaccurate description. I wasn’t sure how easy I’d find running at a pace quite a bit slower than usual, so thought I’d use the trails as a way of naturally slowing my pace. As it was very wet and dark, we’d be using headtorches and we’d need to watch our footing more than usual. We started off running from work and did a lap of the local park which had firm, gravel paths some of which were waterlogged … not a good sign. We ran from the path onto a muddy footpath crossing a field which was very slippery as the ground was firm but with mud and water over the top. Had a few ‘Bambi on the Ice’ moments but made it through this with no problems and we were back onto pavements for a couple of hundred metres before we crossed onto a dirt trail and up into a field where the path disappeared under a pool of water. Well … this was supposed to be a cross country run. We took a deep breath and splashed through hoping that the path would appear on the other side. Through the water and across a ploughed field with a slippery muddy path. A quick trip over a piece of exposed wire I didn’t notice in the light from the headtorch and we were onto waterlogged grassy tracks and into the woods. We were thoroughly wet now and the squelching noises from our trainers frightened off any wildlife we might otherwise have seen. These paths weren’t too bad as although there was too much water and the paths were too rough to get any speed up, there wasn’t much danger of slipping over. We started down a steep downhill and became aware that we were now running through a new river about an inch deep which cascaded around our feet as we ran. The ground was very muddy and we both slipped several times but managed to somehow stay upright. It was great fun though! We’d got to the point where we were unlikely to get any wetter and it was fun just to run with hardly any light in the woods! We got to several parts which were just too boggy and waterlogged to run and we had to pick our way carefully around these. The steep uphill had several new rivers running crossways over the path and the ground was too muddy and slippery to run on this part. It wasn’t worth risking an injury and as we didn’t have a time limit, we took it fairly carefully. We reached the top of the hill and the view opened up with the orange lights of Brackmills and Northampton laid out below us. The path was very muddy now and as I took the opportunity to speed up a bit on the downhills, my legs slipped and I landed straight in a puddle of mud. The mud splashed up around me and I ended up with a stripe across my face. Very fetching. I slowed down a bit but the path was treacherous and I kept sliding. I was hearing muttered swearing from behind me as my fellow runner slid around and several stifled laughs as I perfected my impression of a duck landing on an icy pond. However, I stayed mainly upright. Until I got cocky and sped up again – slip! Back in the mud. I wouldn’t have minded but instead of being a gentleman and catching me on the way down, my fellow runner gracefully hurdled me as I slipped over in front of him. After a bit more slipping and sliding around we finally made it to a park where the firm gravel paths were a relief after all of the sliding around. Not so much fun, but a lot less chance of falling over again! Back over the pavements to my office and a hot shower. … And my work Christmas party, where I could eat far more mince pies than was sensible, safe in the knowledge that I’d had a nice muddy run and earned them! Summary: My pacing was a long way off on this run, but I thought that caution on the muddy trails was probably the better option. Maybe next time I should do this type of run with a specific pace on a more stable terrain. A LOT of fun though and definitely a good run! Actual: 1 x mile at 8 min/mile, 2 x miles at 7:25 min/mile, 1 x mile at 8:25 min/mile. It’s raining. Actually ... it’s pouring. And there are puddles EVERYWHERE. I looked at my spangly, new Asics GT2000 trainers. I looked at my clean, new Asics running tights and top. Tonight is most definitely a night for running indoors. I set the treadmill to 6kmph warm up walk for 2 minutes and an incline of 1.5 and did 1 mile at an 8 minute mile (12kmph), 2 miles at 7:25 minute mile (13kmph) and 1 mile at 8:25 minute mile (11.5kmph). This run was scheduled for tomorrow, but I have swapped these sessions over as I have my work Christmas party tomorrow and there isn’t an easy route nearby to do a night speed session on. Goal: 4 miles at a 9 minute/mile pace. Actual: 4.93 miles at 8.52 minute/mile pace. I set my Garmin to work out the average pace so I didn’t have to watch it too closely. The park is very hilly – I also use it as a hill training circuit as 3 laps of the park and a final downhill back to work make it just over 4 miles so it would be just about right. Came in at 8:52 minute/mile over 4.93 miles … it was a bit further back to work than I’d thought. This is my training schedule for the Paris Marathon given to me by Steve Smythe. It's based around the My Asics plan for a 3:35 marathon. Asics Target 26.2 - Getting free kit! Meeting Coaches! Getting Confused on Trains ...! 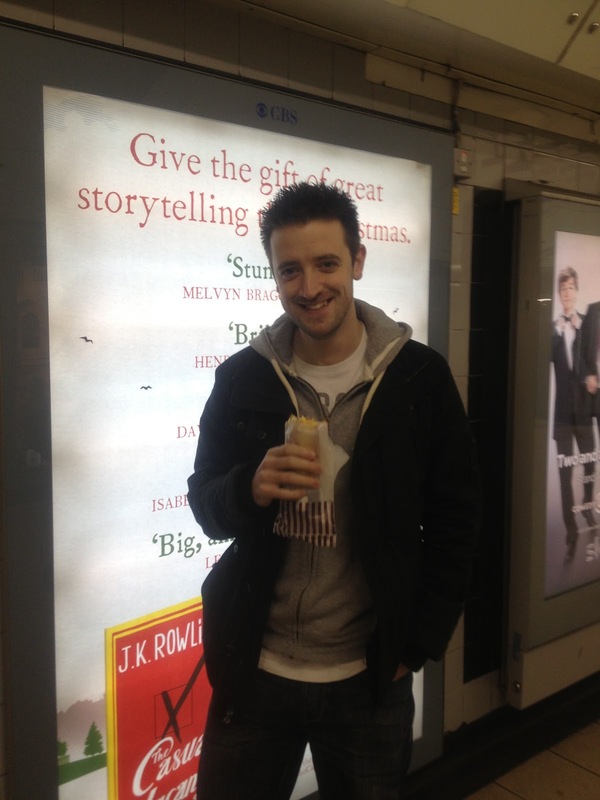 I got to the station this morning to pick up my tickets to London … and back. And found out the very helpful young lady from Virgin Trains who helped me book the tickets over the phone had cancelled my original return ticket and booked me a single. Managed to make it into Euston and met up with Bacon Steve also known as Santa Loves Bacon who is the First Timer in the Asics Target 26.2 project. Bacon Steve prepares for a hard day of photographs by eating more bacon.. I think he twigged that I was a bit of a novice at all of this train stuff when I tried to stuff the five pound note into the card slot of the ticket machine. And referred to the underground as ‘The Tube Train’. However, he resigned himself to the role of carer for the Country Bumpkin and managed to navigate us both to Oxford Street where after a bit of a walk we spotted the Asics store. 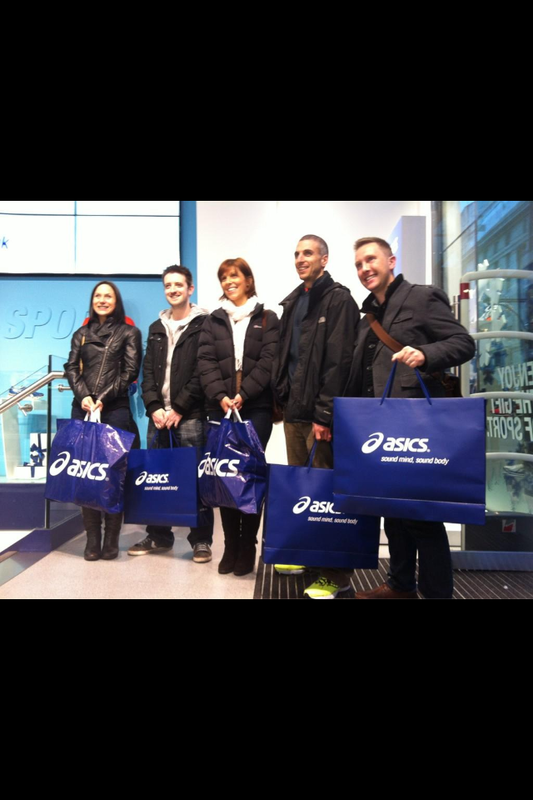 My heart leapt … I couldn’t quite believe that I was here and standing outside the flagship Asics store in Oxford Street! And that we were going to get free kit and photos taken! And meet our coaches. And smile for pics. And generally get spoiled rotten! Woo! As we were half an hour early and the store wasn’t open yet we decided we could do the tourist thing and have our pics taken outside without fear of being spotted by the others and having the mick taken. 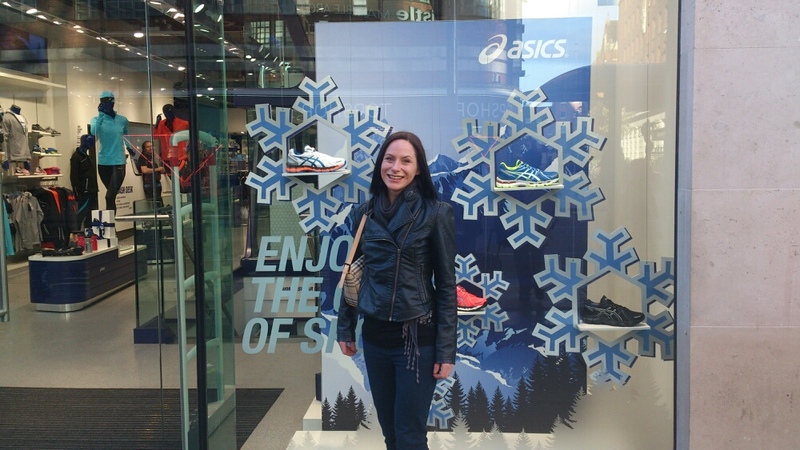 Cheesy grin when I found the Asics Store!! We put on our cheesiest grins and took in turn to have pics taken. We went off to get our coffee safe in the knowledge that our shameful tourist pics hadn’t been seen when Bacon Steve got a call from Kat in the Runners World team. “Hi, we saw you taking pics of the store… then you disappeared. Are you coming back?” Busted! So much for making a cool and insouciant entrance. Kat took us around the store and showed us the clothes. There were also a couple of labs and treadmills all set up ready for gait analyses. It was a really smart store and everything was very hi-tech. 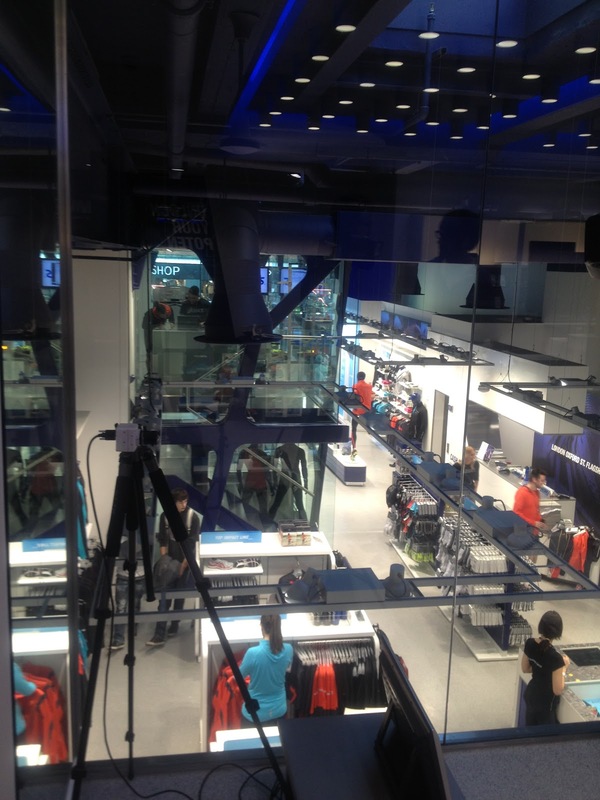 The view across the store from a gait analysis room looking across at the other. We were told to choose 2 full sets of training gear and a pair of trainers all up to the value of £500! Let me just say that again … We could choose kit. Get it for free and we could spend up to £500!!! Eeeeek!! It was strange … normally in a running store I walk in and find the item I’m looking for. Check the price. If it’s under £25 I try it on, if not. I look for something cheaper. But today I could try on everything … I could even –gasp! - coordinate an outfit! Tried on lots of clothes and outfits. Then the camera crew who wanted shots of me smiling while browsing for clothes grabbed me. 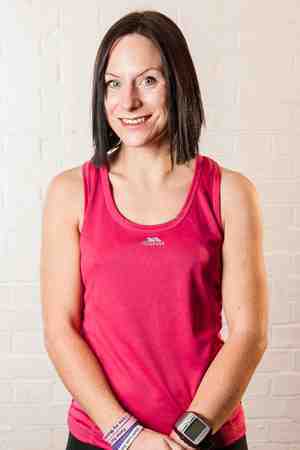 I was ecstatic to be browsing for sports kit and being given it for free but I’m not very good as staged photographs. The best they could really hope for was a bit of a gurn and mad eyes. I tried on the red and black top and black trousers from the Top Impact range and some of the items from the Inner Muscle range. I found a gorgeous pair of long running tights in pink and black. Plus a black top with a zip front and a pink panel. And a beautiful pink running jacket. I had spotted a gap in the Asics range in the shape of garish pink compression socks so I was filling the void with lots and lots of pink clothes. I also chose a pair of amazing leg balance running tights. They felt great on and looked really nice and were supposed to reduce muscle fatigue. Sounds like a win for me … especially on the long marathon training runs! They were also very flattering. Suspect I may have a new favourite pair of running bottoms. Also chose a sky-blue ‘Inner Muscle’ top that improves posture and apparently reduces injury risk! Anything that stops me doing my ‘Hunchback of Notre Dame’ look at the end of a long run has to be a bonus! We were then called for a photo shoot in our new clothes. I came out of the changing room in my pink and black outfit … Mel came out of her changing room and we exchanged looks. Somehow out of all of the clothes in the store, we had decided on exactly the same outfit. Down to the trainers. We had a few staged photos with (right to left) Ady (Shady_Ady), Alex (A.W), Steve (Santa Loves Bacon), Mel (MelanieJayne) and me (RunnyRunRun). I was on the end as seems to be the job of the shortarse. It was quite daunting having a camera pointed at you and knowing the pics would be in such a big magazine as Runners World but it was amazing at the same time … It was slowly starting to sink in that this was it! The photographer gave us instructions. We had ‘stern, serious runners’ face. Then ‘smiley’. Then ‘chatty’. I wouldn’t be able to do this for a job and I gained a lot of respect for celebrities who do. After 10 seconds I got glassy eyes and a fixed grimace. A bit like my office job, but no-one is taking pics of me there. We were told to look like 'Stern, Serious Runners'. I gurned unintentionally. Got whisked upstairs for an interview with Kate from Runners World. She was really lovely although I was put off a little bit by the chap who was doing the lighting and holding a big shiny silver circle opposite my face. It looked like the plate they put Christmas cakes on and I kept thinking I was going to get offered cake. The interview wasn’t too bad. Kate was lovely and approachable. As usual I babbled nonsense but managed to rephrase the question into the answer as requested although my waffle-ometer was on high and I was talking at 100 miles per hour as usual. No doubt it will come out like gibberish. Normal Sarah then. Walked downstairs and was told that my coach was going to be Steve Smythe. He was waiting downstairs and we chatted as we walked. He was very approachable and really nice and totally committed to running. I was expecting him to be a bit scary but he really wasn’t. He gave me some great tips too about getting quicker and advised me how to manage the forum thread. 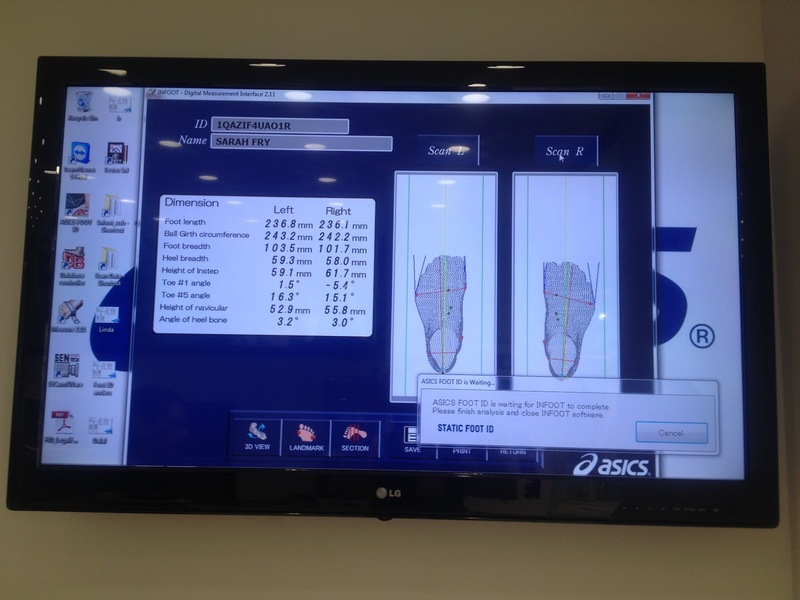 We also had a look at the My Asics training plan. He advised we might add some extra speed sessions in at some point but we would be sticking to the basic plan so it would be easier for everyone else to follow too. 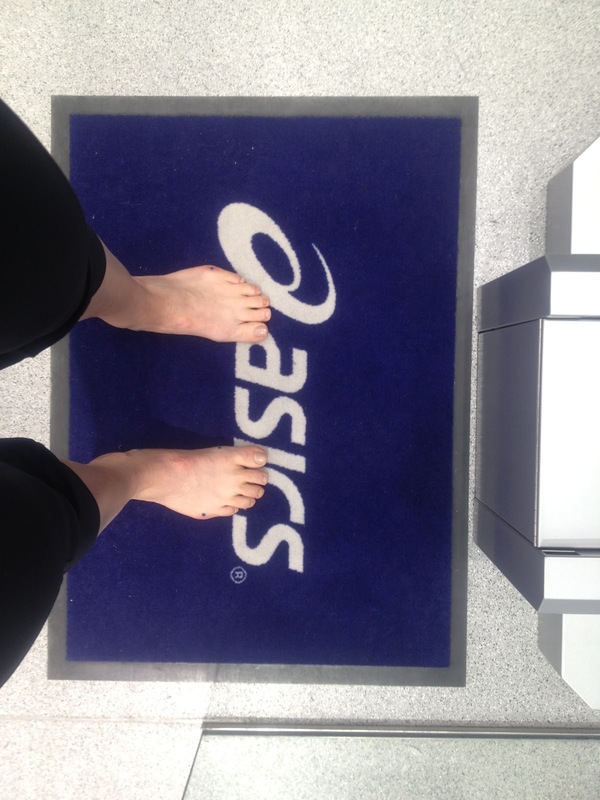 After this, I went with Amelia from Asics to do the foot analysis. I took off my shoes and socks and she stuck blue dots to the widest parts of my feet and my ankle bone. I had to put my foot into a machine like a large shoe box that came up to my knee and which took a 3d image of my foot and showed my footprint. My foot looked like an elephants’. Not the delicate ballet dancers ankles we like to think we all own. Looks like I may be the proud owner of cankles. Dammit. I seem to have lost a couple of the dots somewhere between the treadmill and the chair when I went to sit down to take them off. No doubt they’ll turn up somewhere odd. Probably on my ear in the middle of an important work meeting or something. I then put on a white pair of neutral shoes with strategically placed dots and stripes and had a run on the treadmill so Amelia could have a look at my gait. One foot was neutral and the other was varying between overpronating and supinating. Hmmm. A rogue foot. Tried on a LOT of shoes and probably managed a couple of km on the treadmill with the gait analyses… seems like I am fitting in a run today after all! The neutral trainers with strategic dots and stripes. In the end Amelia recommended the GT2000s in a wide fitting. They felt great and I couldn’t believe I was getting a brand new, beautiful pair of trainers for free! We went downstairs to tot up the purchases and with the trainers, the total came to £470 … of new kit! Mine, all mine!! My usual sportswear shopping consists of me going into Sports Direct, finding something cheap for under £25 and buying it. Couldn’t get over being given this beautiful, beautiful kit! 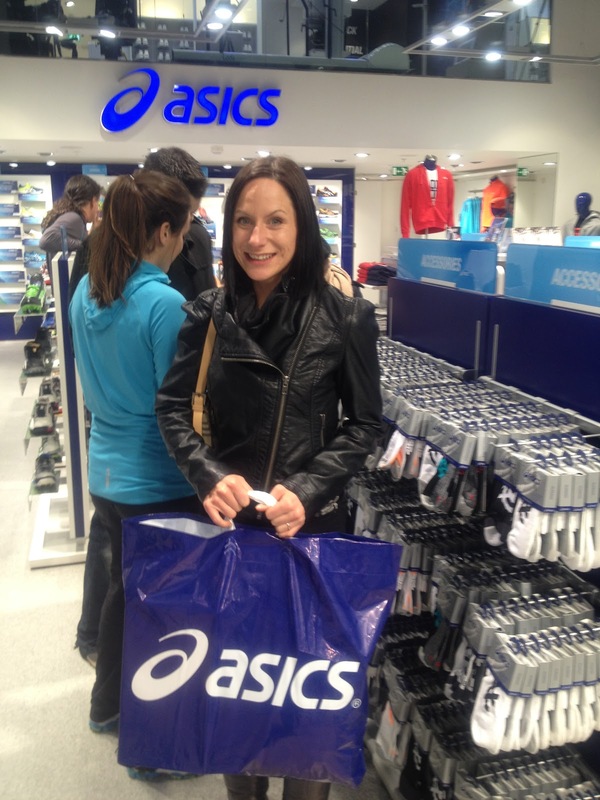 Also … as I was slightly under the £500 limit I was encouraged to go back and grab another sports bra … and some socks! No pink I’m afraid. I’m slightly concerned that this hard training will curb my more bizarre colour choices. Hmmm. Then we were all handed a Garmin Forerunner 210! Wow! What a present! I have absolutely NO excuse to not hit my target with all of this support. The photographer took a pic of us all with our bags going out of the shop. I didn’t have a glassy grin this time! It was SO amazing to be given all of this great kit! I kept expecting someone to stop me as I walked out of the shop. Or the security guard to rugby tackle me or something. I walked back to the station in a daze. Today had been SO amazing and I’m at the start of my journey to Paris …! The Runners World team - these guys were AMAZING!! I've started a new forum thread on the Runners World forum where I've been asked to keep details of my training plan and the runs so everyone else can follow it and train with me for a sub 3:35. Please, please, please come and say hi whether you're training at the moment or not - would be really lovely to speak to you! It hasn’t quite sunk in yet ... I’m going to Paris! I’m ecstatic ... and unbelieving ... and incredulous. But not nervous. I’m looking forward to having a tailored training plan. I’ll have it written down for me. I’ll know exactly when, and how far and how long I should run. I cannot wait!! I just want to get started now! It’s not survivor’s guilt and I wouldn’t be so shallow to think that this is that anything similar. But I’m feeling guilty for getting through when the other – thoroughly lovely and decent – people in my category didn’t. I’m trying to think of the reasons I got through and they didn’t but we were all so different that it’s difficult to know why one got through and the others didn’t. They were all so nice and we had such a laugh in the week of campaigning that I hope they’ll stick around on the forum. Last year when I didn’t get through to the voting stage, I KNEW why I didn’t and I was still gutted that I didn’t get through. It was my first time on a track and my first experience of pacing and I managed to completely mess it up. I also had a tight ITB which wasn’t helping. But I was STILL bitter when I didn’t get through. There were perfectly valid reasons for offering the places to a more competent, experienced and un-injured runner. I knew this, but still was upset. It must be even worse to have gotten so close to the prize and not come home with it. But … I’m in. I worked really hard to prove how much I wanted it and I know that I will work really hard to prove I deserve it. I will be going to Paris. And I will come home with my Boston Qualifying time. And a bloody lovely medal. Over the last week. I have been annoying, irritating and quite often my behaviour has warranted a kick in the arse. I have filled up timelines with pictures – of myself, no less – and links to websites and retweets and have just generally been *that* annoying person. I’ve been manic and bouncing around when things have gone well ... and not so much fun when they haven’t. But ... you’re still here! You may have huffed at my inept campaigning techniques, sighed when I posted yet ANOTHER picture of myself in a hand drawn T-shirt. Looked on in disgust when you reached your car in the evening and SOMEONE has written ‘Vote Sarah #target262’ in the dirt on the bumper. However, you’re still here. Who's THAT dodgy looking runner? There have been pictures in the newspapers, I’ve been posing with racing cars at Silverstone, Parkrunning and campaigning at Coventry. I’m on the front page of Rugby & Northampton AC. I’ve even made it onto the Facebook page of Northbrook AC and have been voted for by members of Yeovil RRC. 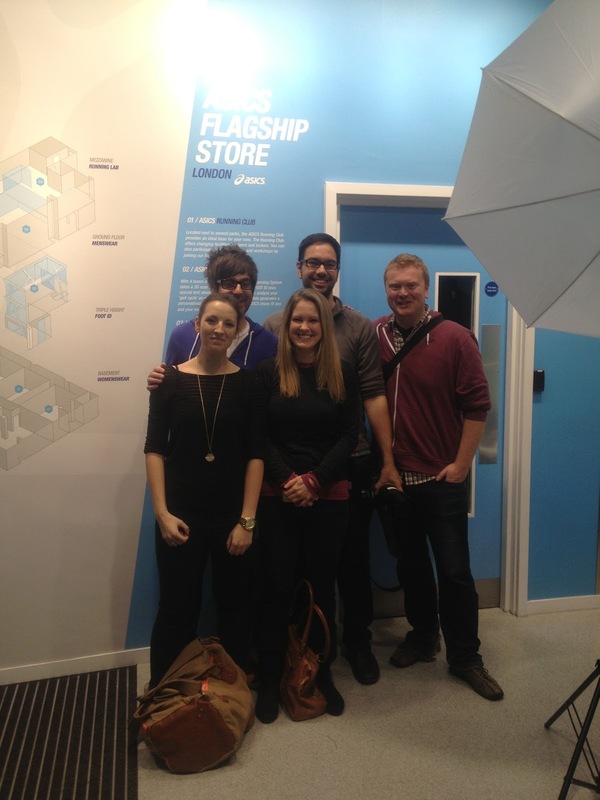 The lovely people at Fetch have been amazing. Facebook posts have been shared, blogs posted, tweets tweeted and text messages, emails and direct messages have all sent and supportive ones – from you – have been received in return. I feel totally loved and it’s all thanks to you. However, it *has* put me in an awkward situation. How on earth do I ever repay this debt? However, if you ever need a favour? I’ll be here. A shoulder to lean on, tweets to be retweeted, a buddy running alongside you wearing a silly hat? I’ll be waiting for your call. Runner's World choose 5 people to fund and train through the Paris Marathon every year. And guess what...!! I have made it to the final 4 in my category! But ... the final result depends on a public vote. Will YOU help me get to Paris? Target: Sub 3:35 ... a Boston Qualifier. My strengths: Hills (!) and my bloody-mindedness – I have an inability to give up!! In a year in which I've completed my first half marathons, my first marathon, qualified for World's Toughest Mudder and won my first Parkrun – can 2012 also bring me a spot in ASICS Target 26.2 for the Paris Marathon? I'm not the fastest runner by any stretch of the imagination but I MAY be the most determined to succeed. I've only been running for 2 years but it feels like I've been running all my life and it's one of the things I use to define myself. Going outside in lycra? I'm a runner. Carrying toilet paper on long runs? I'm a runner. Peeing behind trees? I'm a runner. I run because I can. 5 years ago I was 5 stone overweight and a heavy smoker. My idea of healthy living was adding salad to my doner kebab and having garlic sauce. Garlic is a vegetable, right? Now... I run 35 miles a week and think that lycra is an acceptable clothes choice in public. I’ll bring a drive to succeed to the team and a dodgy sense of humour. You want the warts and all run down on training with the experts? I’ll bring it.